Essentials of Global Mental Health has recently received a certificate of high commendation at the British Medical Association 2015 book award. 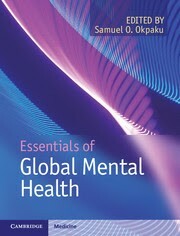 The Essentials of Global Mental Health identifies the great burden of mental health disorders in global health. The authors thoroughly examines various practical community level approaches for prevention and promotion of mental health through the sharing of best information about common mental health problems especially among low and middle income countries. The book defines evidence based steps toward addressing inequality in global psychiatry. I found this book very useful in designing preventive measures in my psychiatry practice every day. I would therefore strongly recommend this book to policy makers, students and teachers involved in the practice of public health and mental health worldwide.